The first study to ever explore biological activity in the deepest layer of ocean crust has found bacteria with a remarkable range of capabilities, including eating hydrocarbons and natural gas, and "fixing" or storing carbon. The research, just published in the journal PLoS One, showed that a significant number and amount of bacterial forms were present, even in temperatures near the boiling point of water. "This is a new ecosystem that almost no one has ever explored," said Martin Fisk, a professor in the College of Oceanic and Atmospheric Sciences at Oregon State University. "We expected some bacterial forms, but the long list of biological functions that are taking place so deep beneath the Earth is surprising." Oceanic crust covers about 70 percent of the surface of the Earth and its geology has been explored to some extent, but practically nothing is known about its biology  partly because it's difficult and expensive, and partly because most researchers had assumed not all that much was going on. The temperature of the sediments and rock increases with depth, and scientists now believe that the upper temperature at which life can exist is around 250 degrees. The ocean floor is generally composed of three levels, including a shallow layer of sediment; basalt formed from solidified magma; and an even deeper level of basalt that cooled more slowly and is called the "gabbro" layer, which forms the majority of ocean crust. The gabbro layer doesn't even begin until the crust is about two miles thick. 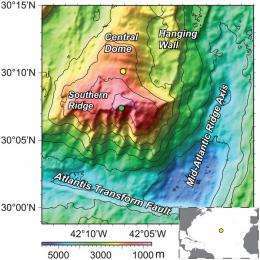 But at a site in the Atlantic Ocean near an undersea mountain, the Atlantis Massif, core samples were obtained from gabbro rock formations that were closer to the surface than usual because they had been uplifted and exposed by faulting. This allowed the researchers to investigate for the first time the microbiology of these rocks. A research expedition drilled more than 4,600 feet into this formation, into rock that was very deep and very old, and found a wide range of biological activity. Microbes were degrading hydrocarbons, some appeared to be capable of oxidizing methane, and there were genes active in the process of fixing, or converting from a gas, both nitrogen and carbon. The findings are of interest, in part, because little is known about the role the deep ocean crust may play in carbon storage and fixation. Increasing levels of carbon dioxide, a greenhouse gas when in the atmosphere, in turn raise the levels of carbon dioxide in the oceans. But it now appears that microbes in the deep ocean crust have at least a genetic potential for carbon storage, the report said. And it may lend credence to one concept for reducing carbon emissions in the atmosphere, by pumping carbon dioxide into deep subsurface layers where it might be sequestered permanently. "These findings don't offer any easy or simple solutions to some of the environmental issues that are of interest to us on Earth, such as greenhouse warming or oil spill pollution," Fisk said. "However, they do indicate there's a whole world of biological activity deep beneath the ocean that we don't know much about, and we need to study." Microbial processes in this expansive subseafloor environment "have the potential to significantly influence the biogeochemistry of the ocean and the atmosphere," the researchers wrote in their report. Degrees what? C? F? I imagine SI units aren't being used.